Thanks again. You are very helpful! I thank you. Maybe this could work with every distro and every desktop? I only have the problem of comics (.cbr .cbz). I think so, but then, how can we see these previews with Antergos Deepin? Why the thumbnails for files .epub and for files .cbr and .cbz in Antergos Deepin don’t show up like in Gnome? I have already installed “gnome-epub-thumbnailer”. Thanks. 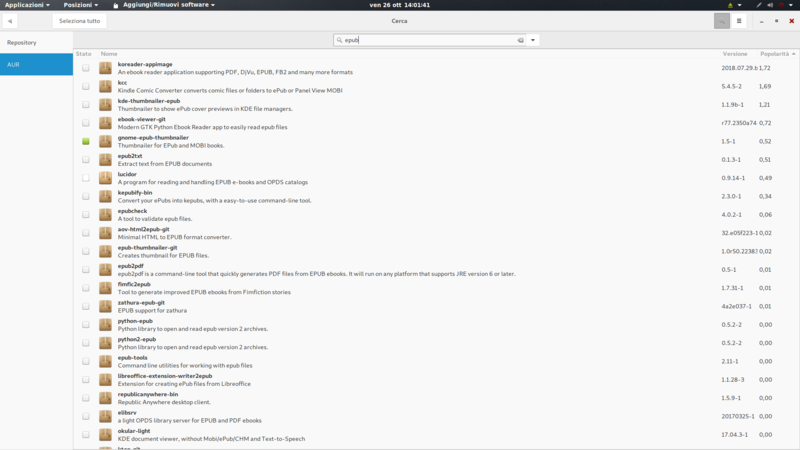 Nessuna chiave "sort-directories-first" nello schema "org.gnome.nautilus.preferences" come specificato nel file di override "/usr/share/glib-2.0/schemas/90_antergos.gschema.override"; ignorato lo scavalcamento per questa chiave. I don’t know what is the package “Jasper” and its function or importance, but Antergos asks to upgrade this certainly useful stuff. And when I try to update this package, the system says that the signature from … “is unknown trust”. :: Il file /var/cache/pacman/pkg/jasper-2.0.10-1-x86_64.pkg.tar.xz è corrotto (il pacchetto non è valido oppure è corrotto (firma PGP)).